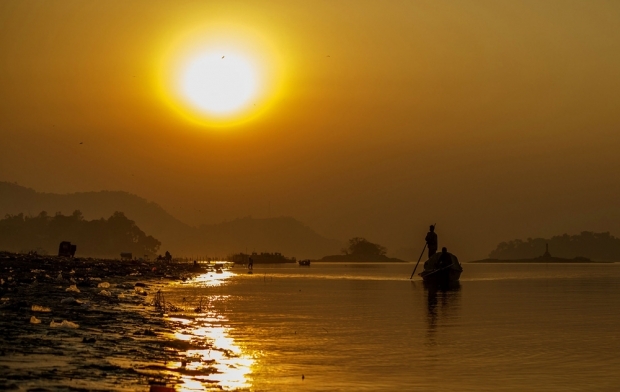 Boatmen paddle down the Brahmaputra River at sunset at Ujanbazar Ghat in Guwahati, India, August 2, 2014. The Brahmaputra originates in Tibet, where it is known as the Yarlung Zangbo. Fishing provides a livelihood for hundreds of thousands who live along the banks of the river but a major dam, the Zangmu hydropower station, may threaten this livelihood. By Liu Qin, Editor in the Beijing office of chinadialogue, where this article was first published. Tibet’s first major dam, the Zangmu hydropower station, started generating electricity at the end of November. This prompted complaints from Indian media that Chinese dam building on the Yarlung Zangbo River could reduce water flow and cause environmental damage downstream in India. But Chinese experts say vested interests in India stand to benefit from playing up the threat of Chinese hydropower and that only dialogue and partnership will solve Asia’s water disputes. The Yarlung Zangbo, one of the world’s largest rivers, rises on the Qinghai-Tibet plateau and flows through China, India, and Bangladesh. It is known as the Brahmaputra once it crosses the border into India. The Zangmu Hydropower Station—northwest of Gyaca county in the Tibet Autonomous Region—cost 9.6 billion yuan ($1.6 billion), took eight years to build, and will eventually generate 510 megawatts of electricity. China has repeatedly promised the project, as a run-of-the-river plant with no dam or reservoir, will not reduce water flow downstream. But this has failed to allay Indian concerns. Li Yuanyuan, Vice-Director of Hydropower Planning and Design Institute at the Ministry of Water Resources, told chinadialogue that the accusations were unnecessary and “India’s media are imagining threats.” China is building hydropower dams “to end Tibet’s electricity shortages,” he said. The Indian media has reported China’s construction of hydropower facilities on the Yarlung Zangbo will cause floods, mudslides, and environmental damage. There are also concerns China could exercise leverage over India by stopping the flow of water from the dam in the event of conflict between the two nations. Whether it’s between India and China, or India and Pakistan, despite the frequent rows over water nobody is prepared to start a war over these resources. Conflicts remain limited to diplomatic tussles, and limited cooperation continues. He argued playing the China card makes India’s politicians appear strong, fans nationalist sentiment, and wins votes. For the state governments, particularly those on the border, the “China threat” can be used to win a bigger slice of government funding and infrastructure investment. In recent years, the government has increased attention to border regions, in response to the media hype around the “China threat,” with major new infrastructure projects benefiting the state governments concerned. Water resources have long been a source of tension in Asia. Asian nations are unwilling to sign up to the U.N. watercourses convention for fear it will limit their development of hydropower. However, tensions have never erupted into full-blown conflict. Xie said that “whether it’s between India and China, or India and Pakistan, despite the frequent rows over water nobody is prepared to start a war over these resources. Conflicts remain limited to diplomatic tussles, and limited cooperation continues." Asia lags far behind Europe when it comes to cooperation over water. Asia is the only region in the world that doesn’t have a multinational agreement on the use of any international river, Wang Weiluo, a Chinese hydrologist living in Germany, told Deutsche Welle. Wang compared this to the Rhine in Europe, where an international deal regulates dam-building by any one nation. Xie Chao added that unlike Europe, Asia has no common body such as the European Union to promote regional cooperation. Although economic interdependence in Asia is growing, lack of mutual trust results in constant friction and conflict. Geologist Yang Yong said that given the size and nature of the Zangmu dam it will not have a major impact on the ecology or hydrology of the region. But he said there was still an urgent need for cooperation on the international rivers rising on the Qinghai-Tibet plateau.